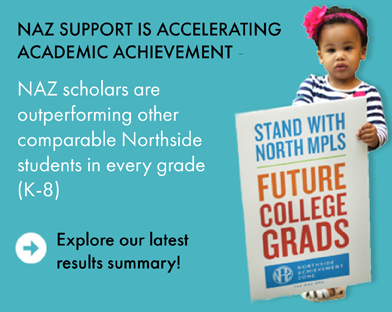 The Northside Achievement Zone (NAZ) exists to permanently close the achievement gap and end generational poverty in North Minneapolis. Together with our partner organizations, we are walking side by side with low-income families as they put their children on a path to college. NAZ has a game-changing approach that is closing the achievement gap. NAZ’s wraparound framework effectively supports low-income children of color so that they will graduate from high school prepared for college. Fox 9 presents a short history of Northside Minneapolis. Watch to see where we’ve been and — with the committed investment of Northsiders, entrepreneurs, social enterprise, and nonprofits — where we are going. “It’s like when you think of your success and happiness, it’s college,” Munye said. They’ve staged massive walkouts from school. They’ve publicly called out the National Rifle Association and local lawmakers. Now, young Northsiders taking their fight for stricter gun laws to their largest stage yet: the nation’s capital.